Copying data using USB drives at the work place can be a major security concern. Copying data to USB drives can be disabled via a simple registry tweak. For this tweak to work in Windows XP, you need to at least have SP2 installed. 1. Open the registry editor by going to Start > Run and typing ‘regedit‘. 2. Open the “HKEY_LOCAL_MACHINE\System\CurrentControlSet\Control\StorageDevicePolicies” key. If the key does not exist, create it by going to “Edit > New > Key“. 3. Right-click on the right pane and select “New > DWORD Value” or “DWORD Value (32 Bit)“. 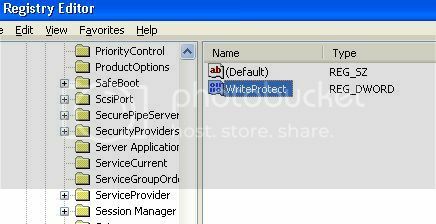 Name the entry “WriteProtect“. 4. Open the new entry and set it’s value to “1“. Restart your computer for the copy-protection to take effect. To re-allow write access for USB drives, just change the value of the “WriteProtect” entry to “0“.